Gone are the days where ‘Brick & Mortar’ businesses can rely on word of mouth and local advertising in order to attract customers (although this still helps of course). With the rise of the internet and especially smartphones, consumers are finding local businesses in different ways, and if your business doesn’t adapt, you may be losing out on a large number of potential customers. There have been numerous studies of the past few years into how many searches in Google are made with local intent (ie. people wanting to find a service, restaurant, shop etc. within their current location). A study conducted by Google themselves, suggests that 56% of searches conducted by consumers on the go from their smartphones have local intent, and that 4 out of 5 consumers used search engines to search locally. This particular study was conducted in 2014, and since then the use of smartphones has only increased, and with this also has the number of consumers searching with local intent. For more information on how Moz gathered this data, read the full article here. As can be seen in the graph above, although there are multiple areas to consider when it comes to optimizing your business for local search, but it seems that having a well optimized and full Google My Business Account is arguably the most important factor when it comes to ranking locally, and as such, this is where we’ll start. 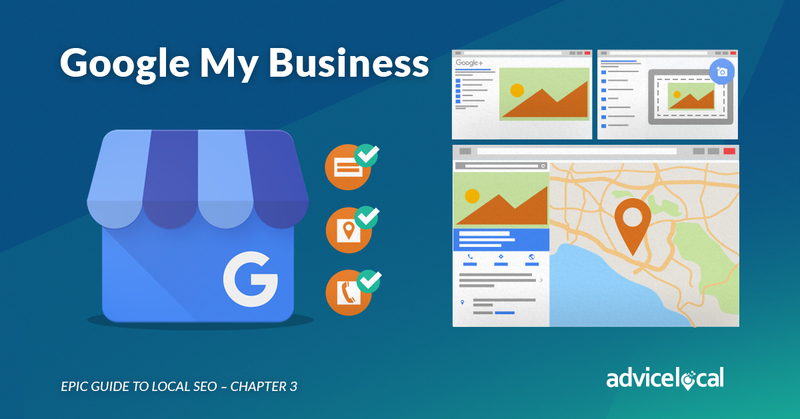 Google My Business is Google’s own directory of sorts where you can create a local business listing which to appear within Google’s search results. Before your My Business listing will show in the search results, your business needs to be verified by Google. This can take up to 2 weeks, as Google needs to send a postcard containing a verification pin code to your given business address (thus verifying its existence and that you are the business owner). as this will increase your chances of appearing in the ‘local pack results’. Alongside including accurate NAP (Business Name, Address & Phone Number) information and correctly categorizing the business (it’s important that this is as accurate as possible! ), you should also include a detailed description of the business, opening hours, business offerings, price range, payment method etc. If you have a website (which you should! ), the website address should also be included. Also be sure to include plenty of photos of the business and your company logo within the profile. If there’s options to add more information which you feel is relevant to your business, don’t hesitate to do so, again the key is to make your profile as complete as possible. Local citations are mentions of your business name and address on other websites. 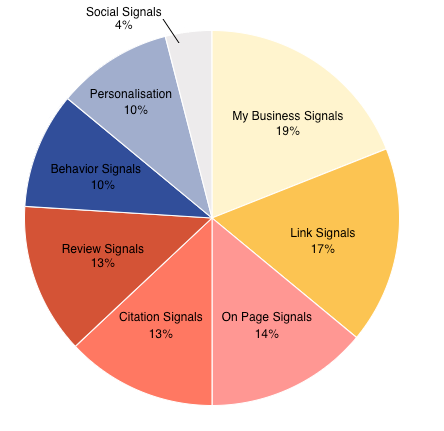 The most common types of local citations are directory pages. Most businesses will want to be included within high authority directories such as Yellow Pages, True Local and Yelp, but also smaller local directories and directories which are relevant to your business are also great places to be listed. For example if you own a cafe in Melbourne which serves exclusively gluten free food, it would make sense to have your business listed on a website such as the Australian Gluten Free Eating Directory (this directory was taken from the top 10 results when searching for ‘Restaurant Directory Melbourne’). Searching in Google like this ‘[business category] “Directory” [location]’ is a great way to find local relevant directories to add your business to. One thing you need to keep note of though is the consistency of the citations. It is important that the NAP information included on all websites is exactly the same. If it needs to be updated, unfortunately it should be updated across all directories in which it is listed. This is because Google uses these citations to determine what information to return about the business within the search results. If the information found in these citations is inconsistent (even down to small typos), Google may provide incorrect information within the search results, or even worse not return any result for the business at all! Editorial links are important when it comes to building link authority to your site. These types of links can be earned by reaching out to local bloggers or influencers working within your niche, and developing a working relationship, hopefully leading to your business being featured on their website in some way or another. Using the Gluten Free Restaurant example from earlier, a link to your restaurant’s website in a post on local food blog would help to push the needle when it comes to local SEO. Not all links have to be editorial however, another great way to earn local links from related business who’s don’t directly compete with your own. For example, if you run a local butcher’s shop and you supply meat exclusively to a number of local restaurants in your area, these restaurants may have supplier information on their website, by leveraging your existing relationship with the restaurant owner, you could politely request for a link to your own business website to be placed on the restaurant website. There are many different ways to build local links to your website, but it can be a long and arduous task, so you should start compiling a list of potential directories to list your business details, alongside local influencers and relevant websites where you may be able to have your business mentioned and linked to as soon as possible. have been increasing rapidly over the past few years. 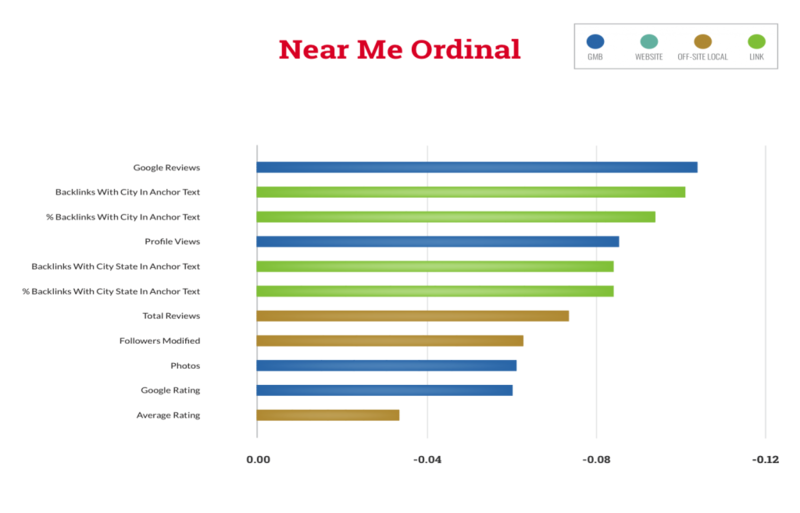 Local SEO Guide actually released a comprehensive study on these types of searches earlier this year, which reinforces the idea that Google is using link data to determine where business as placed within the ‘local 3 pack’ results for ‘near me’ searches. Reviews are massively important when it comes to local search and Google has said that having “High-quality, positive reviews from your customers will improve your business’s visibility”. Google uses metrics such as the review rating given, number of reviews, and diversity of the reviews to help determine where it will place your business within the search results. So obviously, having a high number of 4 or 5 star reviews gives you a better chance of ranking higher for local search results, and maybe even within the ‘local 3 pack’. Obviously, as it’s Google we’re talking about, Google reviews themselves are the most important when it comes to how your business is ranked (and you can even sort the local results by the Google review score), however as mentioned, review diversity is important, and Google will also takes reviews in other popular websites such as Yelp and Tripadvisor into account, as well as looking at reviews on your business’s Facebook page and other social media platforms. Reviews definitely shouldn’t just be considered as a ranking factor for local search however. Reviews can make the difference between a consumer choosing to visit your business or taking their patronage elsewhere. 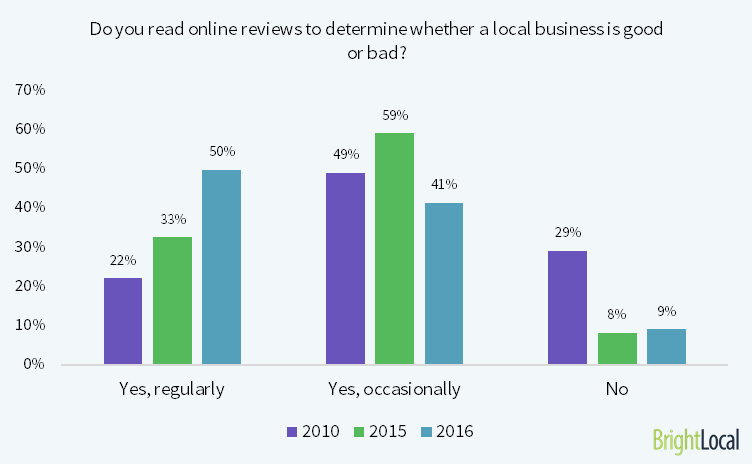 The 2016 Local Consumer Review Survey conducted by BrightLocal provides some invaluable statistics when it comes to how consumers see online reviews. The results show that 91% of consumers read online reviews, 74% of consumers will trust a local business more if it has positive reviews, 84% of consumers trust online reviews as much as they do personal recommendations, and 58% of consumers believe that the star rating of a business is the most important factor when it comes to making their decision. These statistics alone are enough to show how important online reviews are to you local business. The question now is; “how do I get these reviews?” Firstly, as tempting as it may be, don’t create ‘fake reviews’. Google has explicitly warned against this, and it’s spam detection algorithm is pretty good at picking these up. What Google does recommend is to prompt actual customers to your business to leave reviews in their own time, whether it be by giving them a business card with a reminder on it or sending a friendly email a few days after they have visited or used your service. As mentioned above, don’t just focus on getting reviews for Google, encourage customers to review your business on different platforms, whether it’s Facebook or Tripadvisor etc. (note that some websites such as Yelp have a policy against directly asking for reviews, so be sure to read the website’s terms and conditions before reaching out to customers). The results of the survey show that 7 out of 10 consumers will leave a review for a business if they’re asked to. Obviously it goes without saying, there’s no point asking for reviews if your customer service isn’t up to scratch, as all you’ll likely get is negative feedback, but as long as you provide your customer with a great experience, when asking them for a review, the odds are in your favor. Inevitably, chances are you will still get a negative review from time to time, as no matter how much you try, you just can’t make everybody happy! When this happens, instead of panicking, just respond to the criticism in a polite and professional manner, and use it constructively. Displaying your willingness to accept fault, and deal with the complaint appropriately will show other potential customers reading these reviews that you are a professional and courteous business owner, hopefully making them less likely to be dissuaded from visiting your business based off of a few negative reviews. Although not the perfect snippet as the Meta description is being cut off, the title includes the business type (dentist), location (Fitzroy, Melbourne) and brand name (St Vincent’s Dental Care). This result also ranks second within the ‘local 3 pack’ results for this query. Using keyword research (you can read our previous article on generating long tail keywords here), you can find out exactly which keywords to include within the title of your businesses homepage (assuming this is also the target landing page), and optimize them accordingly (note that, although page titles are considered the most important element when it comes to keyword placement, be sure to use target keywords throughout the on page copy where applicable too, this can be a small as just including the name of the location where your business is located). However, be aware that there are character limits for Meta titles, and if you exceed this limit your title may be cut off within the search results. The ideal length for a Meta title is anywhere between 50 – 60 characters as Google will be able to show all of the title, but up to 70 characters is often allowed depending on pixel width. It’s best practice to check how your title looks in the search results, to ensure that it isn’t being cut off. Like Meta titles, Meta descriptions also have a character limit, which in this case is up to 160 characters (or 180 depending on pixel width). Unlike Meta titles however, Meta descriptions don’t affect how Google will rank your business page, but having an informative, well written description (alongside accurate Meta titles) has been shown to increase CTR (click through rate). As with Meta titles, be sure to check how your Meta description looks within the search results, to ensure that the entire description can be seen. Fully optimizing Meta titles and descriptions (whilst staying within the character limit) can make the difference between a potential customer clicking through to your website, or choosing a more enticing option from the search results. Including the appropriate Schema Markup within your business pages can also help when it comes to local search visibility. Schema markup is code which can be added to web pages to help search engines better understand the content and therefore return more informative results to users. At the very least, it’s advisable to add NAP (name, address, phone number) schema to all contact information throughout the site (this acts as almost a ‘virtual business card’), as well as adding organisation schema around the business logo (this will show Google the preferred image to return for the business within the knowledge graph). This code would be added to the Contact page (or wherever the address can be found on your website). You can use Google’s Structured Data Testing Tool to ensure that the code which you have created is fully functioning before adding it to your site. One last thing to note with regards to local SEO, is not to forget the importance of traditional SEO practices, such as ensuring that your website is technically sound, easy to navigate for users and search engines, contain high quality content and pages load properly etc. Launching a local SEO campaign is a mammoth task for any new or established business, and results cannot be expected overnight. However, if you use the above information as a starting point, you should increase the visibility of your business within the local search results, thus hopefully leading to more customers, more sales and more success! I think that you can do with some pics to drive the message home a little bit, but instead of that, this is magnificent blog.